Weighty Matters: Butter better than margarine? New study says saturated fats not tied to heart disease. Butter better than margarine? New study says saturated fats not tied to heart disease. You've got to love evidence-based nutrition. And if you're not sure why, here's a reason - last week it concluded that butter's not inherently bad for you. You see last week the American Journal of Clinical Nutrition released a meta-analysis that looked at all the prospective epidemiological studies looking at the relationship between dietary saturated fat intake and the risks of developing coronary heart disease, stroke and cardiovascular disease. What did they find? 21 studies with followups of 5-23 years encompassing 347,747 subjects and virtually zero effect of saturated fat intake on heart disease, stroke or cardiovascular disease. To their incredible credit in their statistical analysis they specifically took into account the nature of the collection of the food records recognizing that food diarizing is fraught with error. The authors also posit that those studies that demonstrated benefit from reduction of saturated fat on heart disease may well have been a consequence not of the reduction of saturated fat but by the substitution of polyunsaturated fats in their place. They also propose that the type of carbohydrates used to replace saturated fat in those studies may have had a role in benefits. 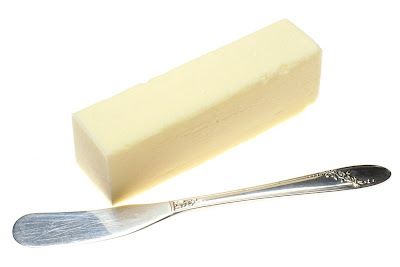 So should you go and eat a stick of saturated fat, I mean butter? Probably not. So is butter inherently unhealthy? Probably not. That said, you're probably still far better off replacing butter with a margarine containing significant amounts of polyunsaturated fats.